I was inspired to attempt this article by a letter just published in the Age because it articulated my own concerns. The only thing it lacks is that it fails to give the principle reason for the very high costs of running a medical practice. It is particularly galling that Labor has adopted the catchcry "Save Medicare". Apparently Medicare is sacred and untouchable. This attitude prevents any possibility of the reform that it desperately needs. It is also galling that Labor is spruiking that the removal of the freeze on rebates will allow GPs to keep bulk billing and this will "save Medicare". The current rebate for a standard GP consultation lasting up to 20minutes is $37.05. Without the freeze, the rebate would be around $39 and by mid-2018 around $40. If GPs had to depend on such paltry amounts for their incomes, Medicare would have died a long time ago. The truth is that GPs who do not see a patient every six minutes can continue to bulk bill by supplementing their incomes with various care plans, health assessments, home medicine reviews, case conferences, practice incentive payments etc. These processes allow GPs to generate a reasonable income, but there has never been proof that they improve health outcomes. The lowly consultation rebate, frozen or not, encourages GPs to manufacture incomes from these dubious methods. Some, dare I say it, "dodgy" doctors do more than their fair share of "dodgy"' care plans. The most important 15 minutes in the health system is the consultation with GPs. It must be valued appropriately so that GPs can take a patient's history, examine them and think about a treatment plan that avoids the current blowout of follow-on costs in investigations and referrals. Medicare must be reformed. Neither Labor nor the Coalition have the honesty and courage to do this. It is more complicated than Labor's puerile and disingenuous sloganeering suggests. Why do medical practices cost too much to run? I'll give you a hint. It's not the insurance costs. A couple of years ago I went for an interview at a GP clinic in an inner suburb of Melbourne, in the region of Armadale or Toorak. It was explained to me that the practice tried to limit the amount of time spent with patients and to make up costs by running various electronic, self-evaluating programs, to diagnose various mental health issues, such as depression. The hard-faced GP interviewing me was keen to tease out any tendency I might have to spend time on supportive or other psychotherapy and it didn't take him long to detect these. "That might be alright for a GP practising in the outer suburbs," he sniffed, "But there is no way we are going to cover costs here and make a profit by spending time with patients. Our mental health nurses here have got it down to a fine art. They use self-evaluation forms as a way of interacting therapeutically with the patients and then they use the same forms for their reports. Personally I think you may be a little too one-to-oneish for this practice." I needed the job, so tried to sound very flexible on these issues, but he wasn't fooled. He asked me whether I had any political philosophy and, before I could answer, he told me that I really should get familiar with Ayn Rand. He was the first person I have ever met, outside a novel, with the exception of some 'counter-culture' heroine addicts in the 1980s, who had ever expressed any open approval of this writer. I had heard that Rand's 'objectivist' philosophy had enjoyed a resurgence with US and other neocons, but I admit that I was shocked to find her lurking in a Melbourne GP clinic. I guess that made me naive, however, if I knew my GP was an avid fan of Ayn Rand, I would run a mile! But, anyway, the thing that most interested me about this job interview was the acknowledgement that the cost of rental and real-estate in Australia, particularly within the inner suburbs, was so prohibitive that a doctor wishing to succeed simply could not afford to spend time with patients and, furthermore, artfully deployed gimmicks and electronic questionnaires to take the place of proper physical and mental examinations and treatment. Because the major cost of doing business in Australia is the cost of land and rents. A business-owner must pay for two premises: the one he or she sleeps in and the one they do business at. Furthermore, they must pay their staff high enough wages for their staff to be able to afford Melbourne's high rentals and house prices. Australia has some of the highest land prices in the world and that goes a long way to explain why small and medium business enterprises so frequently fail. It also explains why Australian manufacturing is in decline and unable to compete with overseas products which do not have nearly as high costs. And high land prices drive up the cost of everything else, including power and water. Even insurance goes up because it must meet this inflation. And it explains why medicare rebates are no longer adequate to cover patient visits and why GPs practically give you the bum's rush out of their offices almost as soon as you enter, why they won't let you tell them more than one thing that is wrong with you, and why they won't take time to discuss their diagnosis, and why their diagnosis is so often wrong! Service quality probably increases with distance from the city as the land and rent costs diminish. Maybe some city GPs tak refuge in Ayn Rand in order to rationalise their increasing exploitation and degrading of social capital in an effort to make ends meet. And whose fault is this? It is the fault of the growth lobby, which has succeeded in raising immigration rates so high in Australia that there is permanently rising inflation of land-prices. Both major political parties and the Greens are responsible parts of this lobby. The first two have massive investments in land-speculation and financing. The Greens utterly refuse to say anything against the engineering of massive population growth in Australia. A side effect of city doctors in Australia needing to supplement their incomes from patients by putting them on health care plans health assessments etc. must be that their minds are focussing on paying the rent rather than on how they can apply themselves to their patients' medical problems. There is a not so subtle difference between the 2 ways of operating.
" A business-owner must pay for two premises: the one he or she sleeps in and the one they do business at. Furthermore, they must pay their staff high enough wages for their staff to be able to afford Melbourne's high rentals and house prices. Australia has some of the highest land prices in the world and that goes a long way to explain why small and medium business enterprises so frequently fail. " Also, surely when plans and schemes become over-sized, they collapse due to dis-economies of scale! Medicine is now more technological, advance and there are more treatments and diagnostics available. That means treating patients is more complex now, with a bigger range of medicine. Along with massive population growth, our budgets are under heavy stress. Health care is being treated as an optional extra, or something that is available depending on how much money you are willing to spend on it. Another casualty is shopping centres. Many stores are finding it difficult to stay afloat, as Westfield et al charge exorbitant, ever increasing rents. 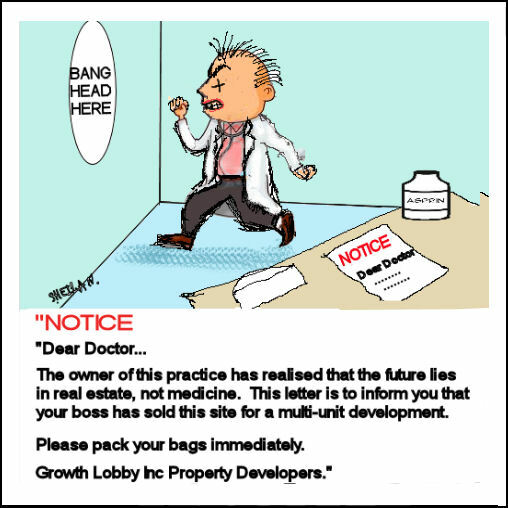 High real estate prices are really only a boon to banks and landowners, and that it is. It is a mentality from the middle ages where everyone (including royalty) were sick and diseased, and the economy revolved around rent seeking and fuedalism. The modern economy provides a higher quality of life, because it moved towards rewarding those who produce and create, instead of those who merely own. We are moving back to a situation where wealth is based only on ownership of assets and not production and innovation. This may be part of the reason why global economies are stagnating despite all efforts to try and prop it up.